Autumn catchfly has long been in cultivation as a common, quite vigorous rock garden plant. It is hardy and easily grown, and was first described as new to science in 1838. 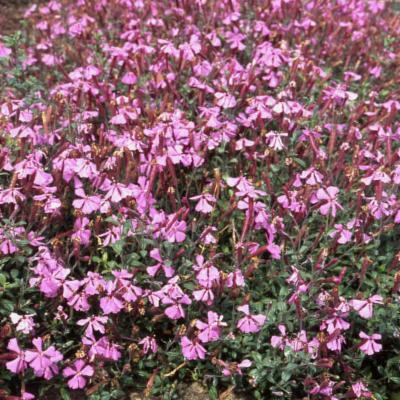 Autumn catchfly is a popular plant for a rock garden, flowering at a time when most other alpines are long finished. In 1846 a painting of this species appeared in the Botanical Register, where John Lindley wrote: 'It is seldom that so charming a recruit as this can be added to our hardy herbaceous species, for without any exception it is one of the prettiest of all border and rock plants'. Native to Azerbaijan and northern Iran. From southern Azerbaijan its range extends eastwards into the Iranian Provinces of Gilan and Mazanderan, at the southern end of the Caspian Sea. Silene schafta is a loose mat-forming species, with slender stems that will tumble over rocks, providing some welcome colour in late summer. 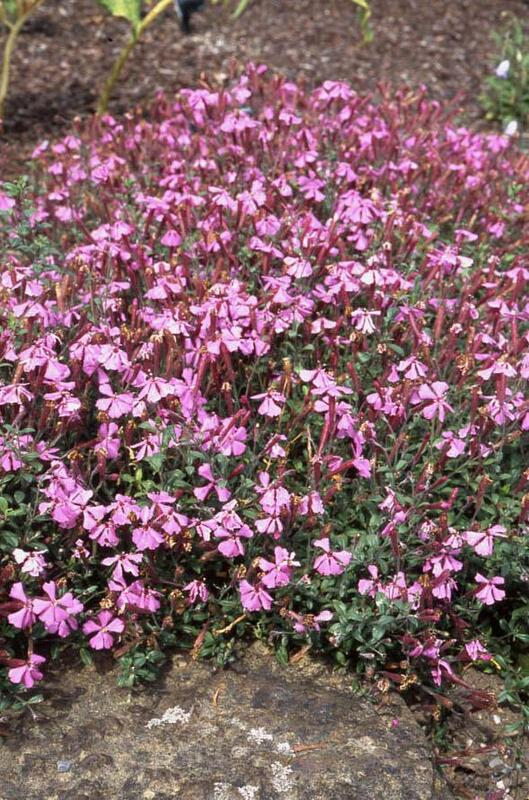 Its deep pink to reddish-purple flowers are produced from July to October. The prostrate (lying flat) to ascending stems of this species can reach 25 or 30 cm long and end in a loose dichasium (a type of flower in which two opposite branches arise below each terminal flower). There can also be some solitary flowers. 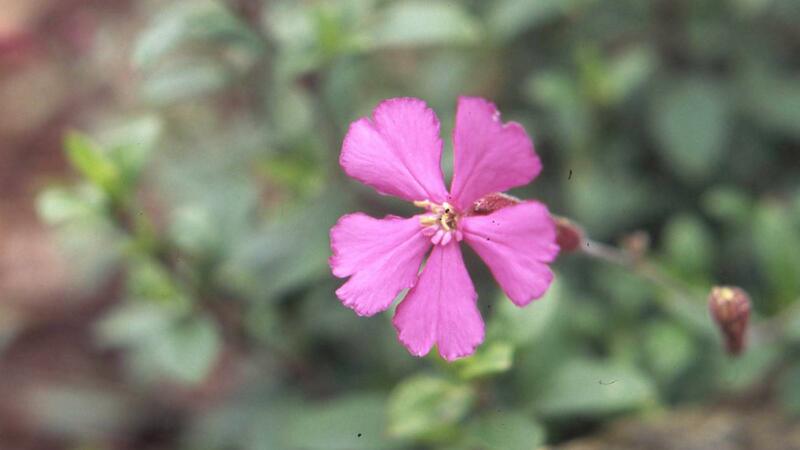 The narrow, pubescent (hairy), pale purple or rarely pale pink calyx (sepals) is up to 2.8 cm long. The spreading petal-limbs are around 1 cm long and shallowly divided into two lobes. At the base of each petal-limb is a coronal scale (appendages on the petals) and together these form a raised ring at the centre of the flower. 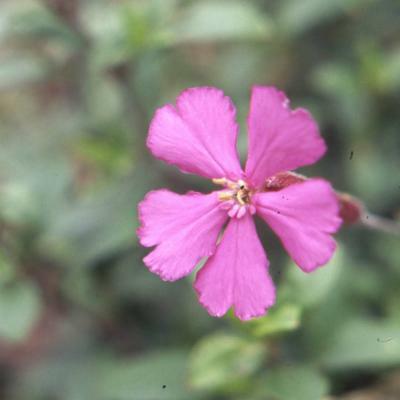 Silene schafta is cultivated as an ornamental. William Turrill, former Keeper of Kew's Herbarium, wrote in Curtis's Botanical Magazine that Silene schafta was grown in Britain 'at least as early as 1844'. This species needs to be placed carefully in the garden, as it can spread quite rapidly and smother smaller plants. It should be planted in a sunny position, in a free-draining but moisture retentive soil. It is best sited on a ledge so the roots are shaded by the surrounding rocks and the stems can trail downwards, displaying their bright flowers from July until autumn. Growth continues throughout the summer and although this plant can tolerate some drought, it does better if the soil is not allowed to dry out completely. A thick mulch of grit will keep moisture away from the foliage in winter. Cuttings of non-flowering shoots can be taken in summer and autumn and this species can also be increased from seed sown in autumn or winter. Silene schafta can be seen growing in the Rock Garden at Kew and in the Rock Terraces at Wakehurst. Spirit-preserved specimens of Silene schafta are held in Kew's Herbarium, where they are made available to researchers, by appointment. The details of one of these specimens can be seen online in the Herbarium Catalogue. Rocky places at altitudes of 900 to 2,700 m.